The nice folks at PAAS sent me some egg decorating kits for today’s craft segment on “Take Five & Company.” The kits include neon dyes and cute stickers to make eggs that look like monsters and fish. Since these egg dyeing kits are self-explanatory, I’ll focus on showing you how I use these dyes to color yarn after the egg decorating is done. So here we go. 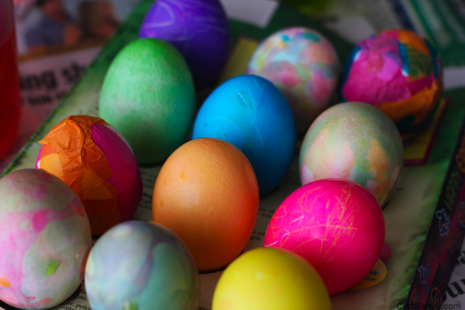 2) An alternative to plunking the eggs into cups of dye is to give the kids paint brushes and let them make water color eggs by painting the eggs with dye. (Be sure to carefully cover the work surface and dress them in old clothes if you go this route. 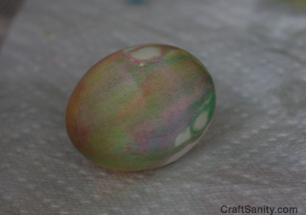 Egg dye stains. 3) Once the eggs are all decorated. Make some small skeins of white or off-white wool yarn. Soak the yarn in soapy water for about 10 minutes. (I used dish soap.) 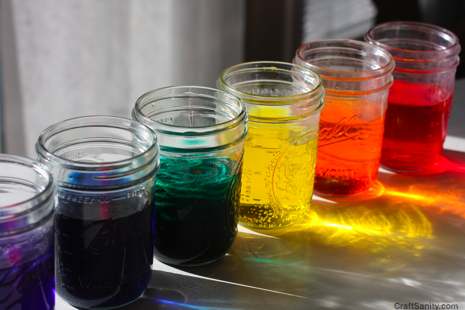 Rinse the soap out and plop a skein into glass each jar of dye. 4) Heat the jars up in the microwave in 2-minute bursts until the yarn soaks up all the dye and the water is clear, or you’re satisfied with the color of the yarn. (Instead of waiting for the yarn to absorb all the dye, you can take out the first skein when you’re happy with the color and put in a new skein. The second skein will be lighter the first, but there should be enough dye to color two small skeins. 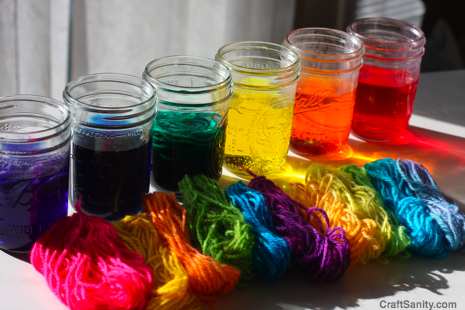 5) Let the jars of yarn cool. Then rinse the yarn until the water runs clear. 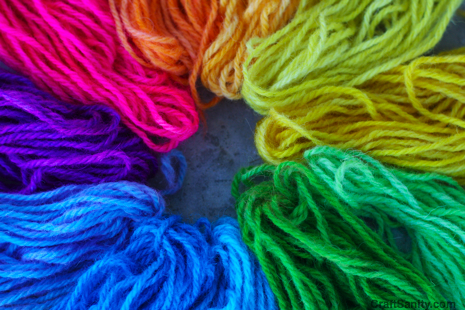 Hang up the yarn to dry and use it in your next fiber art project. ** Note: I wouldn’t knit your grandma a sweater with yarn dyed with egg dyes because I’m not sure how colorfast it is. I use this yarn for weaving projects with the kids. If you’re going to make something wearable, make a swatch and wash it as you would your finished project to test how the color holds up. ENTER TO WIN: Leave a comment below about your favorite Easter or spring craft tradition and enter to win some PAAS egg decorating kits, so you can dye some eggs and yarn at your house. The deadline is March 28. Good luck! CONTEST UPDATE: Congrats to Melissa H! You are the winner of the PAAS egg dye giveaway! Enjoy! Below is the clip from today’s “Take Five” segment. I simply wanted to construct a word in order to appreciate you for some of the splendid facts you are writing at this website. My considerable internet investigation has at the end of the day been rewarded with good quality know-how to write about with my family members. I ‘d express that many of us readers are rather fortunate to dwell in a notable site with so many brilliant professionals with very beneficial tricks. I feel extremely lucky to have discovered your entire site and look forward to so many more fun moments reading here. Thanks again for all the details. Hi there! I just wish to give a huge thumbs up for the good information you have got right here on this post. I shall be coming again to your blog for more soon.